Preheat oven to 180°C (or 160°C for fan forced oven). Thinly slice potatoes with a sharp knife, three-quarters of the way through, from one end to the other. Place potatoes onto lined baking tray and cover with canola spray, season with salt and pepper. Place in oven for 1 hour. While potatoes are cooking, add garlic to butter and melt in microwave for 1 minute, then set aside until needed. Dice bacon into small pieces and fry until crispy, then remove from pan and drain on paper towel. Mix together in a bowl the cheeses and breadcrumbs. After 1 hour, remove potatoes from the oven, pierce potatoes with a knife to ensure they are cooked through, if not give them more time in the oven until soft. When cooked, baste with the butter/garlic mix, then put cheese/breadcrumb mix in between the potato slices. Place back into the oven for another 5 minutes, just to melt the cheese. 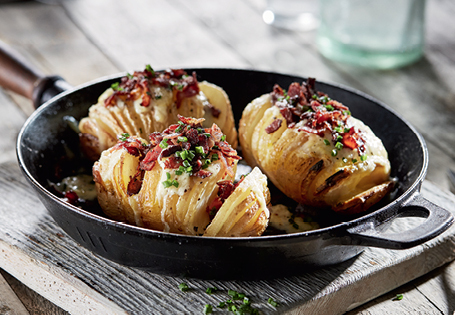 Remove from oven, season with salt and pepper and put bacon on top of the potatoes. Sprinkle chopped chives over the top of the potatoes. Dollop potatoes with sour cream if desired and serve immediately.